SAN DIEGO–San Diego State director of athletics John David Wicker announced the hiring Monday of Derek Grice as executive associate athletic director for Mission Valley development. In his role, Grice will be responsible for the planning, design, budgeting, construction and operation of the SDSU Mission Valley project, specifically the new multi-use Aztec Stadium and its incorporation into the overall SDSU Mission Valley site. He will work collaboratively with athletic department executives, development and facilities and operations staff, as well as SDSU Project Management, Facilities Planning, Design and Construction, Facilities Services, Business and Financial Affairs and contracted consultants. 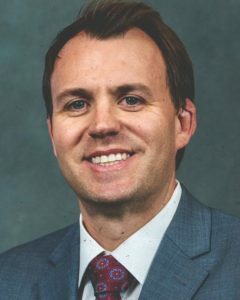 Prior to his arrival on The Mesa, Grice was a member of the Georgia Tech Athletic Association executive staff, where he served as associate athletic director for facilities, operations and events since September 2015. During his tenure in Atlanta, Grice worked as the project manager for all GTAA’s major construction and capital projects, including the Noonan Golf Facility, ACC Network Broadcast and Video Operations Center, football locker room renovation, as well as videoboard upgrades throughout the athletics campus. In addition, Grice was instrumental in the Georgia Tech athletics master planning process, highlighted by the Intercollegiate Athletics Initiative 2020, where he has developed and managed more than $88 million in major projects. Not to be outdone, Grice provided direct oversight and leadership for event operations, facilities and grounds, spearheading Georgia Tech’s efforts to host major championship events, including the 2018 NCAA Men’s Basketball South Regional and 2016 NCAA Men’s and Women’s Swimming and Diving Championships. He was also GTAA’s key contributor in forging partnerships and hosting initiatives with the Atlanta United (MLS), Atlanta Hawks (NBA), Atlanta Dream (WNBA) and the Georgia high school state basketball championships. Prior to Georgia Tech, Grice spent three years as senior associate athletic director for facilities and event management at the University of North Texas from 2012-15, serving as project manager for all major construction and capital projects while overseeing all game day operations for home athletic events. He also acted as sport supervisor for the Mean Green swimming and diving teams and was a member of the university’s master planning committee. Grice launched his career as an athletic administrator with a nine-year stint at Texas State University, serving as director of athletic facilities and game operations from 2003-06 before earning a promotion to assistant athletic director in September 2006. During his stay in San Marcos, Texas, Grice managed more than $70 million in capital projects and was a primary member of the committee that developed The Drive – a comprehensive campaign for the elevation of Texas State to the Football Bowl Subdivision. He also served as sport administrator for the Bobcats’ baseball and softball teams. A native of Hattiesburg, Miss., Grice earned his bachelor’s degree in sports administration from the University of Southern Mississippi in 2002 and his master’s degree in sports administration from USM in 2003. While at Southern Miss, he worked as a graduate assistant in event management, facilities and internal operations.